Two new studies prove that cannabis tinctures have several advantages over traditional edibles. Here is how they stack up. 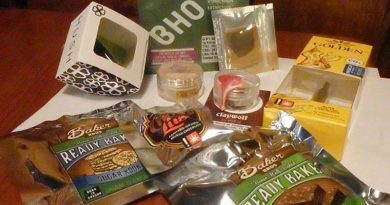 Cannabis edibles come in many forms: tablets, capsules, pretzels, cookies, brownies, gummies, etc. However, cannabis tinctures are fundamentally different—they are a liquid form of cannabis. Tinctures are alcohol based extracts of cannabis that can be drunk by themselves, or added to other drinks or food. Dosing of edibles can be challenging. It is difficult to determine when the maximum effect has been reached. Did you dose too low, or has it just not kicked in yet? 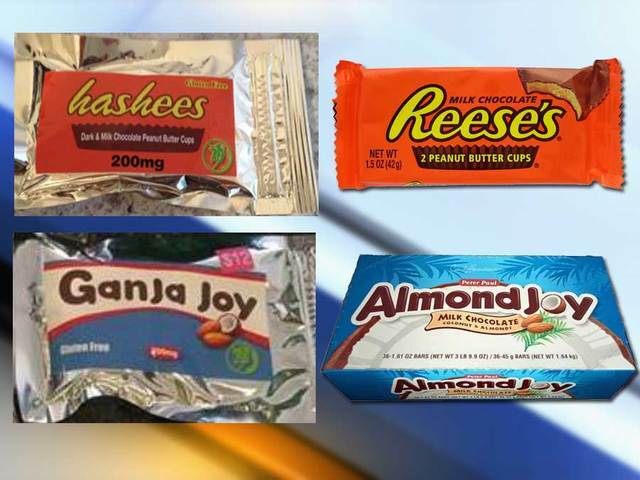 Absorption of the THC in edibles is different for everybody and is often unpredictable. Finally, it matters whether you take edibles on an empty stomach or after a meal. Taking edibles on an empty stomach changes the ratio of THC to CBD absorbed and can predispose people to experiencing greater anxiety. Tinctures can solve many of the above issues. 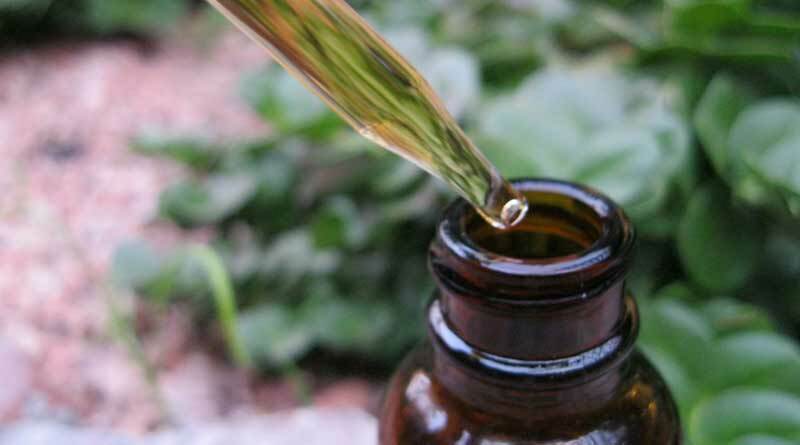 Read on to find out about new science that proves tinctures are the way to go! Dronabinol is a capsule of synthetic THC that is approved by the FDA as an appetite stimulant in AIDS-related anorexia and to treat chemotherapy-induced nausea and vomiting. Due to some of the above issues (slow and inconsistent absorption) INSYS Therapeutics has recently developed a tincture of dronabinol that is now approved by the FDA. They call it an “oral solution”, but it’s basically the same as a tincture. The main difference is that it is synthetic THC instead of a cannabis extract, which contains a mixture of cannabinoids. As part of the development of this product, they did several studies comparing the capsule and solution (i.e. tincture) forms of THC. One study was under fasted conditions and the other study was after a high-fat meal. These studies give us a great opportunity to see how tinctures differ from edibles in controlled clinical trials. Read below to see what we have learned! With tinctures, you get more bang for your THC buck. Specifically, 18% more THC was absorbed with a tincture than with a capsule. Not a huge difference, but enough to give it a little extra kick! The caveat is that this only happens on an empty stomach. A fatty meal will increase THC absorption enough that it won’t matter what form you take THC in. With edibles, THC has to dissolve in your gastric fluid before it is absorbed. Since the THC is already in solution with a tincture, this step is not a limiting factor. After taking the tincture, THC could be detected in the blood of all of subjects within 15 minutes (empty stomach) or 30 minutes (with food). It took several hours to detect THC in the blood of 100% of patients who took the capsule, whether on an empty or full stomach. There will always be some variability from person to person in how they absorb THC no matter what form they take it in. However, the ideal edible will have as little variability as possible so that there are predictable effects. 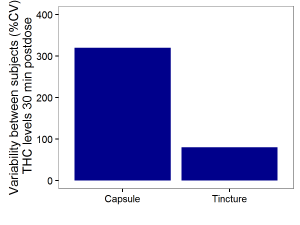 These studies showed that the person-to-person variability in the total amount of THC absorbed was actually similar between tinctures and capsules. However, there were drastic differences in the amount of THC absorbed within the first two hours after dosing. The variability at 30 minutes after dosing, for example, was 3 times higher with capsules than with edibles! 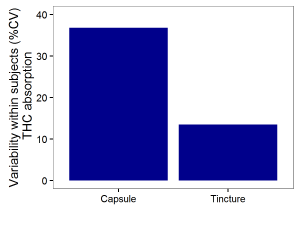 This shows that if two people take the same dose of a tincture, they are more likely to feel the same effects come on at the same time and with the same intensity. With a capsule or other edible, the same two people may feel the effects come on at completely different times or one person may feel it much more intensely. 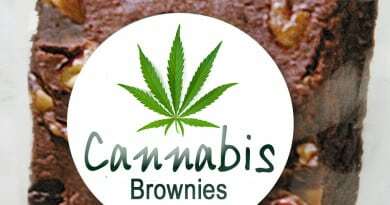 Imagine you take the same cannabis edible 10 times in a row (well not literally in a row, but on different days). You would hope that the same amount of THC is absorbed each time, but realistically it will always be a little different. In one study, both the tincture and capsule were given on two separate occasions. This allowed an assessment of how consistently THC was absorbed for each person. 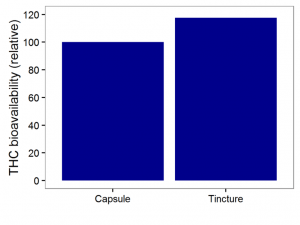 The tincture had a time-to-time variability that was 63% less than the capsule!. 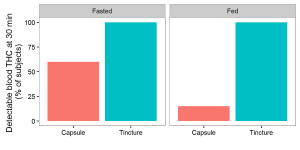 This shows that the effects of a tincture are likely to be more consistent each time you take it. One limitation of these studies is that dronabinol capsules and solution contain pure THC – so they could not assess the absorption of CBD or other cannabinoids from tinctures. Nonetheless, these two studies provide us clear scientific evidence of the advantages of tinctures compared with edibles. Tinctures give us more rapid and consistent THC absorption. © 2017 Professor of Pot. All rights reserved. Syndicated by special permission. WELL, I stopped reading after the statement saying that a synthetic form of THC ( Dronabinol) was used in the study. If your going to do a study on cannabis, then study the “real thing”. Not use something made in a lab with God knows what in it and try to pass it off as a cannabis study! I think it is important to study what is available considering the restrictions we face in the USA on obtaining anything worthwhile to test. The large studies are limited to getting their cannabis from NIDA, so a real effective study with real cannabis is not possible. Maybe you should read the whole article before deciding it’s not worthwhile. Well professor, I have been telling everyone this for 8 years now. I just simply put my tincture in an empty capsule and that is the same thing. The small amount of time the tincture sits under your tounge will provide a slightly faster action of noticing a “feeling” but the real power and action is happening when the liver processes the compounds into the bloodstream. I just forgo the sublingual absoption and focus on dose calibration and consistency of dosing.